Common Name: Poison nut: Quaker buttons. 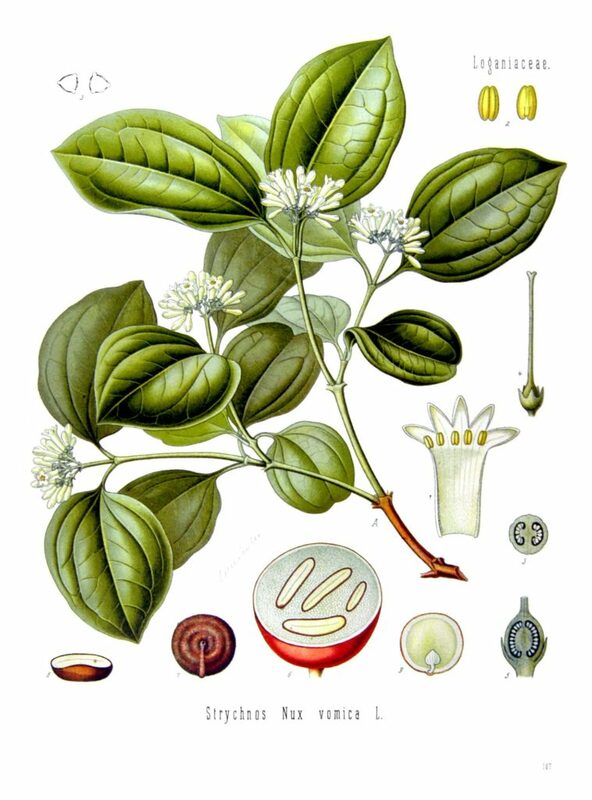 Nux vomica is prepared from the strychnine-containing seeds of the Strychnine or Poison Nut tree. Once prepared in homeopathic potencies, the remedy is non-toxic and safe for use with infants through to the elderly. Those who need Nux vomica do things to excess. They overwork and overindulge in food, coffee, stimulants, and alcohol (it is a key remedy for hangover). They are competitive, driven, irritable, and intolerant of the shortcomings of others. Eventually, nervous exhaustion leads to sleep difficulties, and sensitivity to smells, light, and sound. Pains are cramping and spasmodic, and worsened by sedentary habits. Sneezing on waking or after eating. Nose runs during the day but blocked or stuffy at night. Better for fresh air and worse for warm, stuffy rooms. High fever with chills, backache, shivering, and sweating. Chilled by the slightest draft or movement under the big clothes. Sore, bruised pains in bones and joints. Worse in the morning after overindulgence (hangover), loss of sleep or mental strain. Bilious, dizzy, and oversensitive to light, noise, smells. From mental exertion, worry, or alcohol. Wakes between 3 to 4 a.m. and falls asleep again when time to get up. Indigestion from alcohol, rich food, or coffee, or mental strain. Bitter, sour belching. Flatulence from tight clothing. Cramping pains better for warmth or warm drinks. Vomiting, diarrhoea or constipation with ineffectual urging. Constipation from sedentary habits, travelling, overeating. Constant urging, relieved by sitting in a warm bath. Digestive upsets after excessive or rich food. Nux vomica (Nux) is available from our online store as a single remedy and is also included in the following Complexes (combination remedies): Colic; Common Colic – Watery; Hay Fever; Headache – Migraine; Indigestion; Jet-Lag; Nausea; Over-indulgence & Hangover; Reflux; Smoke Stop; Snore Ease; Teething; Winter Defence.